Blutengel was born in 1998, after Chris Pohl left the Seelenkrank project. The first album, "Child of Glass" was realeased in 1999, and quickly became popular, thanks to such tracks as "Weg zu mir", or "Beauty of Suffering". In those times, female vocals were sung by Kati Roloff and Nina Bendigkeit, but after the release of "Child of Glass" Nina left the band, and was replaced by Gini Martin. For the first time we could hear her voice on "Seelenschmerz" CD, released in 2002. 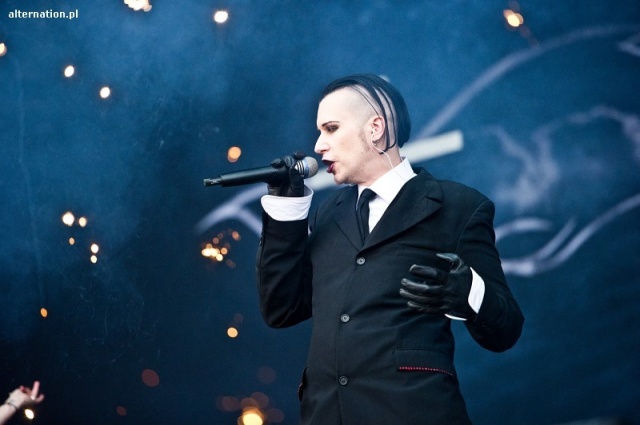 In 2001 Blutengel played live at Wave-Gotik Treffen in Leipzig for 10.000 people. After two other gigs, and publishing "Black Roses" single two girls, Kati and Gini left the band, to work on their own project, Tristesse De La Lune. Chris found a new vocalist Eva Poelzig, and together they recorded "Angel Dust", realeased in 2002. Back then, the duo decided to improve their shows, by adding new visual elements to the performance. In 2003 they played on Wave-Gotik Treffen for the second time. In that year they also visited Woodstage Festival, Mera Luna Festival, the Electric Gathering Festival, and, together with Within Temptation, Dark Storm Festival in Berlin. In 2004 they relesed another album, entitled "Demon Kiss". It was another success. Blutengel recorded also a live CD, "Live Lines". In 2005 they published a new EP , "The Oxidising Angel".